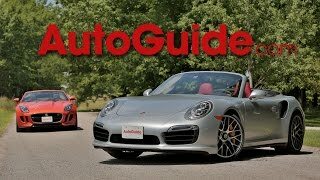 Porsche has unveiled details of the new 911 Turbo and Turbo S Cabriolet ahead of their global debut at the Los Angeles Auto Show scheduled for November 20. Both models deliver the same blend of dynamism, performance and efficiency offered by the Coupe version. Both the models offer an eye-catching feature which is the exclusive Porsche panel bow top with its lightweight magnesium frame. This innovative technology has permitted the cabriolet to maintain a coupe-like arch to the roof when the top is closed. This arch, which also offers advantages in terms of aerodynamics, as the roof can be opened or closed in approximately 13 seconds at speeds of up to 30 mph (48 km/h). 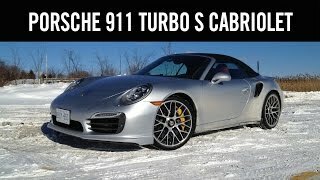 The 2014 Porsche 911 Turbo Cabriolet is powered by a 3.8-liter six-cylinder turbocharged engine delivering 520 HP (383 kW) in the open-top 911 Turbo and 560 HP (412 kW) in the S model. 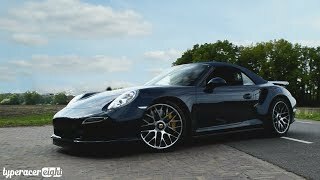 The cars accelerate from zero to 100 km/h (0-62 mph) in 3.5 and 3.2 seconds respectively, reaching a top speed of up to 318 km/h. Both the models are also up to 15% more efficient returning 17 mpg city / 24 mpg highway. 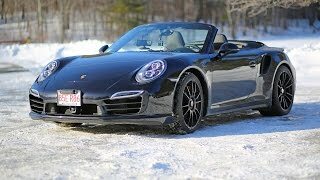 The 911 Turbo Cabriolet model will be launched onto the market in December 2013 and will have a starting price of 160,700 USD while the Turbo S Cabriolet from 193,900 USD. Prices do not include destination charges of 950 USD.